I am working with Rise and embedding Storyline content in it. 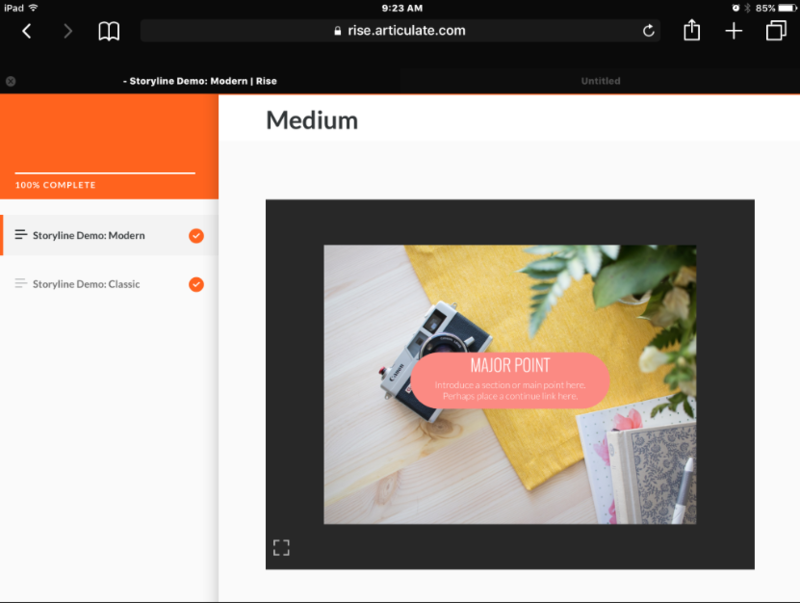 I have noticed that when exporting with modern player from Storyline 360, the white margins around the storyline object are much, much larger, when a course is viewed on the mobile device (a tablet) , than when it is viewed on the PC. Thus, the anyhow smaller content becomes even extra smaller on the tablet, due to the redundant margins. Even if a user enlarges the inner content of the component with finger gesture - the next slide shrinks again. Those white margins just take space around the content. Is it possible to reduce them, so that the content fills in its container completely, just as it does (almost) completely in PC view? I would like to have the same proportions between margin and content for mobile as for PC. To get the most streamlined player from Storyline into Rise, you'll need to turn off the features. Before you select off on "Menus & Controls" go into the features tab and deselect everything. Also,make sure the prev/next buttons are deselected on the individual slides. Then select off on the "Menus & Controls." That gives you the thinnest player. However, there's always a remnant of the player and as the player responds to different screens, the Storyline content is going to scale to fit in that screen, which will create some margins based on the screen's aspect ratio. For example, and iPad is 4x3 and if your Storyline slide is 16x9, it's not going to fit perfectly. I followed all the steps you mentioned, and indeed switching off the controls makes the margins thinner for the PC view, however it does not make any Impact on mobile view -- still very large redundant White area around the content. I am working with standard default Settings of storyline (4x3) , so it feels like there is still a lot of space to scale the content to full width (screenshot attached) . The "make larger" Icon in the bottom left does not appear on all iPad models (only on iPad Pro), and is not intuitive to our users to tap it (which allows the content to be viewed full size). And after the content is expanded, this small Icon glides to the bottom left of the iPad Screen itself, and does not stay near the content, and again they are confused how to get back to the course. It would be very helpful if those margins were not so large after all, even with all controls and Features off, or the controls to enlarge the content would be more communicative and could be found on all mobile devices. Different mobile devices may handle the pages differently. Can you share a link so I can see how it appears on my devices? You can PM me if you can't share the link publicly. I think one challenge when inserting Storyline content is that it requires it's own player to hold the content, thus you have a course nested in a course, so to speak. 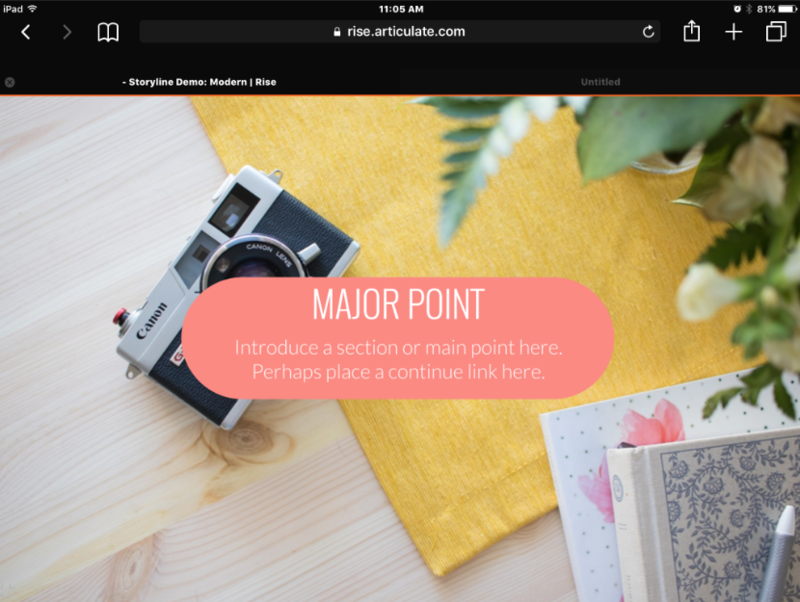 The content inserted via Storyline block can be pinched and zoomed. Thus the end user can make it larger to fill the screen. You go from this to start [image 1] to this when the user increases the view [image 2]. We figured out the pinching, however we hope there will be other possibilities to control the nesting. "I think one challenge when inserting Storyline content is that it r..."